12 Eldridge Street between Canal St. and Division St.
As part of her exhibit, Lashon Hara: On the Consequences of Hate Speech, textile artist Robin Atlas will offer a cut-up poetry workshop for young people at the Museum at Eldridge Street’s WinterGreen Tu B’Shvat* celebration. Cut-up poems will be displayed on the Museum’s Tu B’Shvat tree. Poetry, paper and glue will be provided. 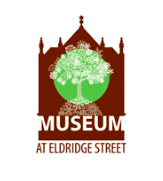 Activities throughout the Museum’s magnificent landmark site, the 1877 Eldridge Street synagogue, will celebrate sustainable foods and living. For people of all ages, faiths and cultural backgrounds. *Tu B’shvat, the Jewish New Year for trees, has in recent years become a Jewish Arbor Day. Directions: Click here for map and detailed directions. Trains: F to East Broadway – Exit at Rutgers Street. B or D to Grand Street.Buses: M15 to Grand and Allen Streets. M15 Select to Hester and Allen Streets. Robin Atlas is a visual artist, print maker, fine arts consultant and curator, whose work has appeared throughout the United States. She creates contemporary visual midrash – the artistic expression of sacred Jewish texts and Halachic laws — adding her own creative voice and vision to the ever evolving anthology of commentary. The Jewish Art Salon is an innovative, international community of artists and art professionals. Since 2008 it has promoted contemporary art exploring Jewish themes and related to current issues. The salon provides important resources and programs for its members; it organizes exhibits, art events, and (in the New York area) bi-monthly salon sessions with international artists and scholars, in order to create an appreciation for innovative Jewish art in the contemporary art world.